Spring is a time of refresh & renewal – a time of new beginnings, for you and your home! But, if the interior of your home is looking more lackluster than luxurious, then maybe it’s time to consider an interior renovation. Interior renovations range can range in job scope and size, and therefore can range in cost. Additionally, interior renovations can be comprised of a number of varying project types; some are refinishing floors, kitchen & bath remodeling, basement finishing, and structure & layout (i.e. open floor plan). Most Interior renovations can improve the aesthetic appeal and quality of your home, which results in an increased home value. When considering an interior renovation, it’s important to hone in on these specifics: what exactly do you want, what’s most valuable to you, your home, & lifestyle, how much are you willing to spend (aka budget!) and lastly, what can yield the best ROI. Furthermore, it’s vital to assess the style of your home. If you live in a home that has a lot of vintage architectural characteristics, then you may opt to maintain some of the charm these elements encompass. Certain unique qualities, such as original built-ins, are preferred and therefore makes your home distinct. But once more, take into account your home’s style and what’s most favorable to your investment. As stated, interior renovations range in project type and consequently range in cost. With that in mind, we’ve compiled a list of interior updates for those who are looking to refresh their home on a budget. Furniture – Furniture can easily “date” the space they reside in. Dependent upon the room, contemplate what’s dating the space and needs to be changed—is it a couch, linens, a coffee table or nightstand? Slipcovers are perfect for those who need the look of a “new couch” without the hefty price tag, while updating bedspreads and throws can easily make your bedroom more cozy & inviting. When it comes to tables, consider either a fresh coat of paint with new hardware or a DIY project (check out this easy table). If you’re not as ambitious but are still feeling frugal, try visiting a flea market or local garage sale—you will be amazed what some folks are willing to part with! Rearrange – An easy way to refresh any room without spending money, is to simply rearrange the furniture! A little feng shui can drastically change how you feel about a room. Additionally, there are a variety of ways to arrange furniture based on the function of the room; living room furniture can be arranged based on if the space is used for entertainment or conversation. When rearranging furniture, consider certain elements of the room, such as windows and focal points that you may want to frame/accent, as well as the “flow” of the area—you wouldn’t want to position bulky pieces in natural walking zones. 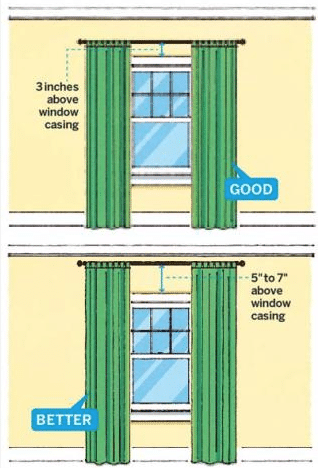 Windows & Lighting – Retreat your window treatments! This easy update can vastly refresh any room and is often overlooked and underappreciated. For starters, it can be accomplished on a budget! Moreover, certain treatments can also give the illusion of taller ceilings if adhered correctly. Your eyes will be tricked to think a room is taller when curtains are hung higher 3’’+ than the window; vertical stripe patterns can also aid in creating this illusion. The quality of a room’s light can be greatly improved, too! And while we’re on the subject of light, it may be time to also update some lighting. Swap out lamps and/or lamp shades and consider installing new light fixtures. It may be hard to imagine, but new lamp shades can definitely make the difference to a room—consider accent colors or patters for this treatment! 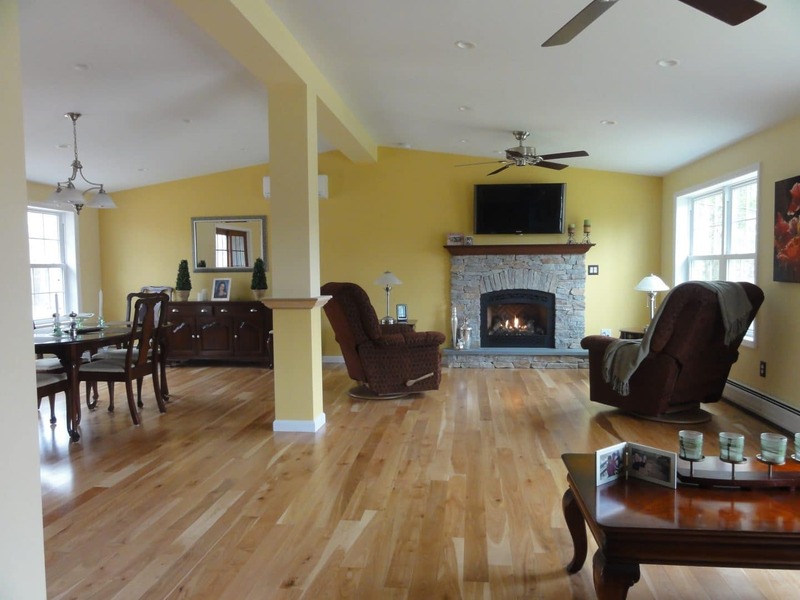 Flooring – If your budget allows for this interior renovation, then we highly recommend it; new flooring often times increases the value of a home. 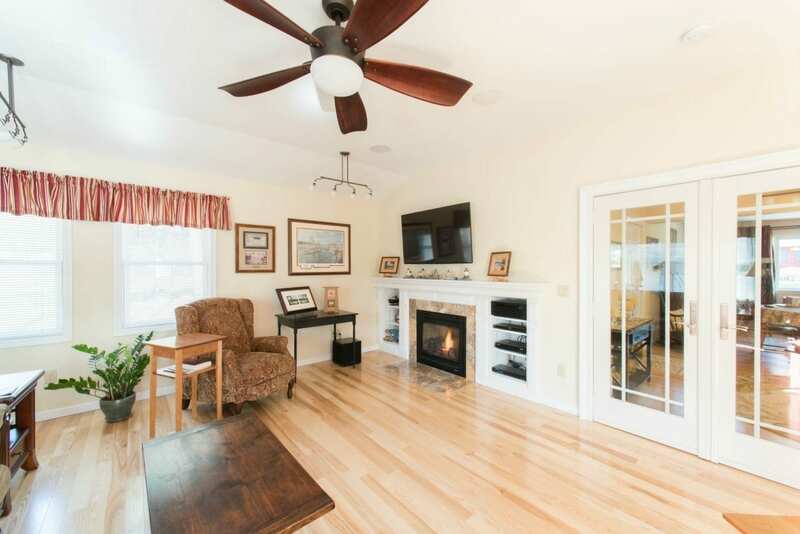 And, whether it’s hardwoods, carpeting, or tile, new flooring yields an immediate update! If your home already has hardwood floors, but are looking weathered, then we recommend enlisting a professional to refinish them; this can be as simple as a fresh coat of polyurethane or a new stain altogether. Keep in mind that many flooring materials can come in a variety of fabrications and can give the look & feel of hardwoods or tile.These can be available at a fraction of the cost, so, it’s important to do your research prior! Décor – Last but not least, this all-encompassing interior renovation is easy, fun, and effective! But, be forewarned, it will be easy to buy anything & everything you like, so, establish a budget and stick with it! A new area rug and artwork are easy swaps for a room. HINT: area rugs should be anchored under furniture feet! We also recommend utilizing mirrors perpendicular to windows, as they bounce light around a room, thus creating a brighter space. Accent pieces should be used to simply accent – be careful not to clutter the space! Select pieces that are either cohesive or pull certain finishes such as brass or silver. Complete the room with fresh flowers and/or candles. Interior renovations can be both big & small and therefore range in cost. For smaller projects, consider implementing any of these listed interior updates. For larger jobs, such as open floor plans/layouts, new floors, kitchens, baths, and all the spaces in between, DBS Remodel is here to help! With over 30 years’ experience, DBS can make the renovation process easy and stress-free! And if you’re one that has trouble “visualizing” the finished product, DBS Remodel utilizes 3D renderings & virtual reality software so that your renovation dreams can further become a reality! Schedule a free consultation today for your interior renovation and refresh your home!